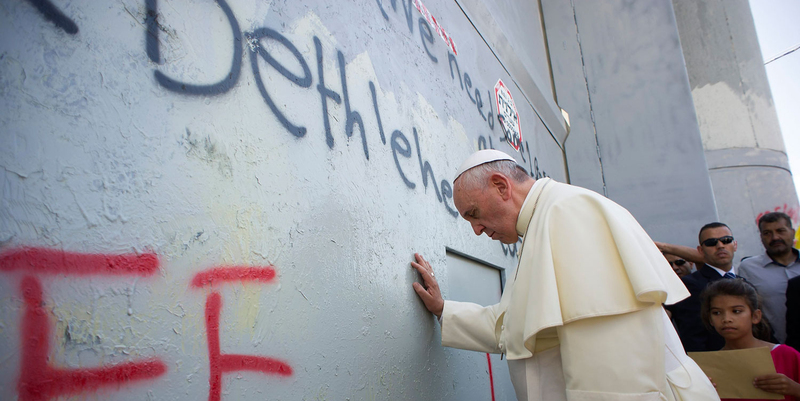 In an open letter, Palestinian civil society groups urge the Pope not to lend his name in any way to the 2018 Giro d’Italia due to its whitewashing of Israel’s military occupation and grave human rights violations. Warm Palestinian greetings from the Holy Land. We are writing to you from the largest and most representative Palestinian civil society entities to urge your Holiness not to give your blessing or lend your name in any way to the 2018 Giro d’Italia cycling race because of its unfortunate insistence on whitewashing Israel’s military occupation and grave human rights violations. We advocate for our UN-sanctioned human rights through nonviolent pressure on Israel, jointly with international civil society and faith based groups around the world. We understand that you have been invited by Israeli Prime Minister Benjamin Netanyahu to launch or bless the 2018 Giro d’Italia, which plans to hold its “Big Start” in Israel next May. We condemn this cynical attempt by the far-right Israeli government to use your good name in this propaganda effort to cover up its brutal occupation and ongoing construction of illegal settlements on occupied Palestinian land, especially in East Jerusalem. We share your love of sports and your belief in its ability “to enrich people's lives” and to “spread a culture of encounter and solidarity.” We also stand by your insight that one of the challenges in professional sports is “maintaining the honesty of sport, of protecting it from the manipulations and commercial abuse.” Indeed, we advocate strongly for the utmost commitment to human rights and anti-racist principles in all sports. However, regimes of oppression, like Israel’s, have always tried to instrumentalize sports to rebrand themselves and escape accountability under international law. The Giro d’Italia organizers claim that the cycling race is all about sports and has nothing to do with politics. However, in exchange for millions of dollars in sponsorship fees from the Israeli government, they are actively aiding Israel in falsely portraying occupied Palestinian East Jerusalem as part of Israel and its unified capital and are working with a company that is active in illegal Israeli settlements. Giro d’Italia is reinforcing Israel's illegal claim of sovereignty over the city of Jerusalem as a whole by displaying images, maps and videos, including of the Al Aqsa Mosque and the church of St. Mary of Agony, as part of Israel, at a time when the Vatican, Italy, the EU, the UN and the whole world do not recognize Israel's sovereignty over East Jerusalem and do not recognize any part of Jerusalem, East or West, as Israel's capital. You have called for a “commitment to ensure that sport is always more inclusive and that its benefits are truly accessible to all.” Israel repeatedly violates this principle. Israel has bombed and destroyed Palestinian stadiums and sports structures and routinely denied freedom of movement to Palestinian athletes. It has imprisoned and shot Palestinian athletes, and killed Palestinian children playing football, more than once. Netanyahu has described the race as “a key event in the celebrations for the 70th anniversary of the founding of the State of Israel.” This is an affront to every Palestinian and conscientious person worldwide who will commemorate May 2018 as the anniversary of the Nakba (“catastrophe”), when approximately 800,000 indigenous Palestinians, Muslims and Christians, were forcibly and premeditatedly removed from their homeland. It signaled the beginning of our dispossession as a people and of Israel’s ongoing systematic denial of our human rights. We urge your Holiness to reject this invitation from Netanyahu and Giro d’Italia. We further invite your Holiness to join people of conscience and human rights organizations around the world to publicly call on Giro d’Italia to move the race from Israel, until a time when Israel respects its obligations under international law and recognizes Palestinian rights. Palestinian Christian Initiative "Kairos Palestine"